Sen. Tom Harkin (D., Iowa) told the New York Times in a recent interview that he is not sure what the big deal is about his aspiring Democratic successor’s comments about Iowa farmers earlier this year—and appeared to predict that he will lose. Rep. Bruce Braley (D., Iowa), the Democratic candidate seeking to replace the retiring Harkin in the Senate, warned a group of trial lawyers at a fundraiser in January that if Republicans retake the Senate, Sen. Chuck Grassley (R., Iowa)—a popular figure in the farmer-heavy state—could become chairman of the Senate Judiciary Committee. He called Grassley a "farmer from Iowa who never went to law school"—remarks that struck a nerve among Iowans and subsequently caused his poll numbers to drop. I watched it and I watched it again, and I thought, "What’s the hubbub about?" He said on that tape that if the Senate goes Republican, a farmer from Iowa who never went to law school will be chairman of the Judiciary Committee. Everything he said is absolutely true. He didn’t lie. He didn’t utter a falsehood. He just said it matter of factly. To my way of thinking, I’d say so what’s the problem here? They said, "Well, he was dissing Grassley." How can you diss someone about which they are proud? I think Chuck Grassley is pretty proud of the fact that he didn’t go to law school and he’s going to be chairman of the Judiciary Committee—first time ever. What’s wrong with that? Harkin has also reportedly angered Senate Democrats by refusing to contribute money from his $2.4 million campaign chest to the Democratic Senatorial Campaign Committee. "It is ridiculous that Bruce Braley is getting outspent by Republicans when Tom Harkin is sitting on over $2 million in his campaign account," one senior Democratic aide told Politico. 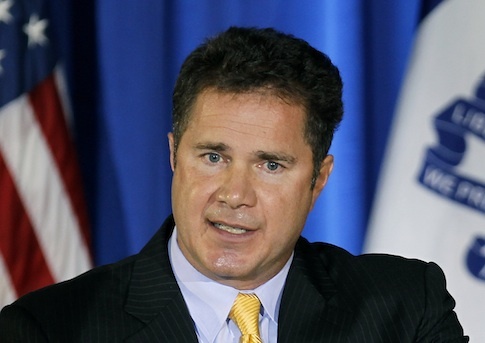 This entry was posted in Politics and tagged 2014 Election, Bruce Braley, Tom Harkin. Bookmark the permalink.